Is Weight Loss Essential To Get Pregnant? Pregnancy is a boon for women. To achieve successful pregnancy, it becomes essential to maintain a healthy weight as it becomes important not only for the mum-to-be but also for the baby-to-be. Losing weight before pregnancy will increase the chances of conception and prevent unnecessary complications during pregnancy. 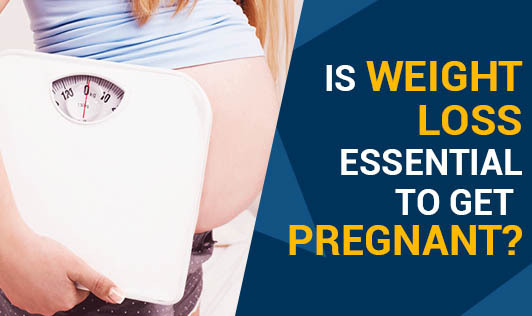 Many researchers have stated that pre-pregnancy obesity has complications such as miscarriage, gestational diabetes, and restricted blood flow to the fetus, pre-eclampsia, preterm uterine contractions, preterm delivery and fetal heart defects. A combination of these factors will often lead to a baby being born with an elevated risk of obesity later in its life. Pre-pregnant, obese mothers, will be at an increased risk of obesity, diabetes and cardiovascular disease later in her life. If the mother is in her ideal body weight (IBW) before pregnancy, she can afford to put on an extra 10 - 12 kg, which is a healthy weight gain. If the IBW is high at her pre-pregnancy stage, she will be reaching obese II/obese III after her pregnancy which can be pretty impossible to reduce. Get the right diet from a dietitian. Your dietitian can be the right guide for you in helping you to lose weight and attain a normal BMI (Body Mass Index). Exercise should be a part of your routine. Exercise is a form of physical activity. It can be achieved by following any of these activities - swimming, working out in a gym, running, jogging, yoga or power yoga. Know what is right for you. Meet an instructor to know that. Get a hemogram done. Hemogram is a complete blood test which includes your WBC count, platelets, Hb etc. A complete hemogram will help you know if you have to match up to any normal level.